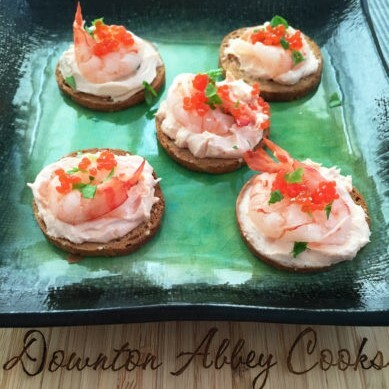 These shrimp canapés have an honored place in food history as the first dish served in 1st Class on the ill fated voyage of the Titanic, April 14, 1912. In skillet, heat oil over medium heat; add shallot and garlic; cook, stirring often, for 5 minutes or until softened. Increase heat to high, add shrimp and sauté, stirring, for 3 to 4 minutes or until shells are pink and flesh is opaque. Transfer shrimp and vegetables to bowl of food processor. Return pan to stove and pour in brandy; cook, stirring, for 30 seconds or until brandy is reduced to a glaze; scrape into shrimp mixture. Puree shrimp mixture until finely chopped. Add cream cheese, butter, tomato paste, salt, pepper, and vanilla. Process until almost smooth. Press shrimp mixture through coarse sieve set over bowl; discard shells. Slice baguette into 20 thin slices. Place on baking sheet and toast under broiler for 1 minute per side or until lightly golden. Reserve. Drizzle lime juice over cooked shrimp halves; stir and reserve. Place shrimp butter in piping bag fitted with star tube. Pipe shrimp butter onto toasts. Alternatively, use a table knife to spread on to the toast. Top with a cooked shrimp half and a parsley leaf. Top each canapé with an equal amount of fish roe.